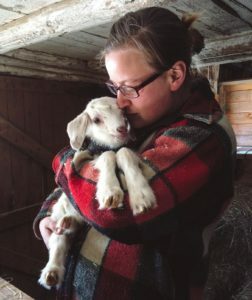 BrennaMae and Brandon of Patch Farm have come full circle. They started down their path to ownership with 4-year lease-to-own on their dream farm–nearly 4 years ago. Without the guidance of Land For Good, I’m not sure we could have had the confidence to continually approach our landlord until we found a way to buy the land,” says BrennaMae. The journey started five years ago, BrennaMae recalls. She was working a farmers market on a late summer morning when she received a text message from her farm and life partner, Brandon, about a farm listing. The property was located in Denmark, Maine, less than a half-hour from their family. The land amounted to about 50 acres wood, 20 acres pasture and had a well kept 1820’s farmhouse with sturdy barn attached. The land had once been a MOFGA certified organic sheep farm, and had diverse terrain, perfect for both animals and vegetables. The house was essentially two homes plopped together with a shared kitchen space–ideal for for them to have their mother live and farm with them. 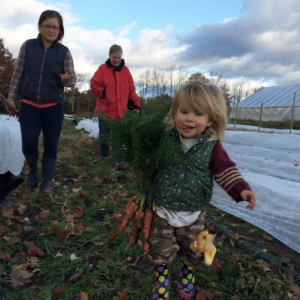 Working with Jo Barrett, Land For Good’s (LFG’s) Maine Field Agent, the farming couple discussed different paths to ownership and found a solution with a lease-to-own model. Jo helped them craft unique lease provisions—like “statements ensuring rent payments would go towards the principal, an option to buy and a right of first refusal clause”—and coached them through negotiations. 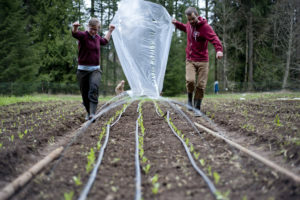 After four years growing their farm, high-tunnels now dot the landscape, bountiful vegetables and fruits burst forth, and grazing animals rotate through fields to restore the soil’s fertility. And they are poised to finalize a USDA Farm Service Agency loan to purchase the farm—and secure the farm long-term for their family and community. BrennaMae and Brandon also knew that finding land was just the beginning. Gaining secure tenure to make the farm their own would take patience, compromise and support. That’s why they reached out to LFG for guidance about how they could own their own land. There are many resources for farmers who want to get on the land. LFG helps farmers access farms and farmland through traditional and innovative methods. Explore LFG’s educational and planning resources focused on farmland access, transfer and tenure.